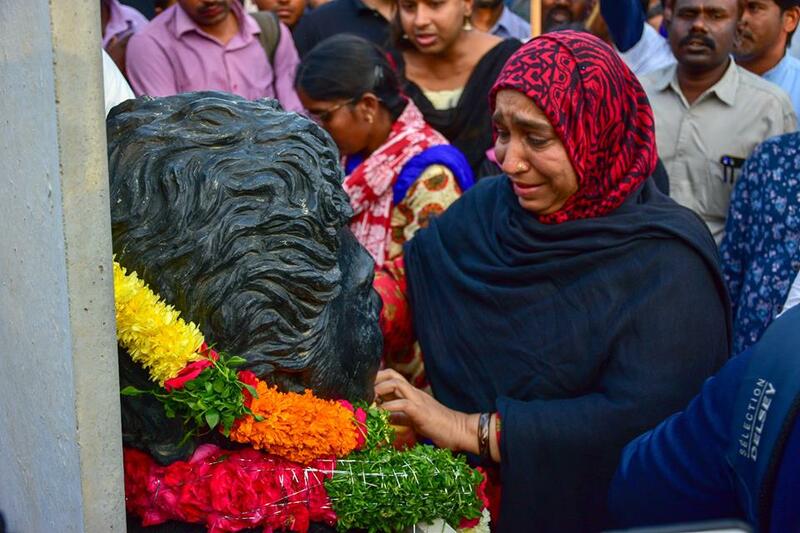 “Like Savitribhai Phule had Fathima Sheikh standing by her, Radhika Vemula today has Fathima Nafees by her side. 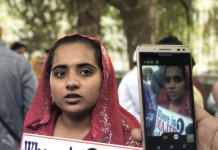 She is not alone,” said Fathima Nafees, mother of Najeeb Ahmad, a student of JNU who disappeared in 2016 from campus, under suspicious circumstances. 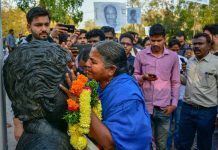 She was addressing the students of the University of Hyderabad during Rohith Shahadath Din, in memory of Rohith Vemula. I am standing here today with sister Radhika. I have been experiencing her grief for the past two years. Her grief is mine too. Her son was taken away from her. He was forced, they broke his will, these people, from away in Delhi, they appointed such people in central universities who unleash violence on Dalits, Muslims, Adivasis, and farmers. Let them do all the violence they can now for they came for five years and they would never come again. They have unleashed violence on the innocent and in central universities, in MP, UP and other places. Sister Radhika has quoted so many names. I cannot recollect any at the moment. Radhika is not alone today. She has her sister Fathima Nafees standing by her. Savitribhai Phule made history fighting for the Dalits in this country. What all didn’t she have to face? People threw books at her, stones and gobar but she had her goal in front of her. She never gave up. Today we see Savitribhai Phule in the face of Radhika Vemula. It’s up to you people here now to take up this resistance of hers into your own hands and help her get her to her goal, her goal of justice. We have to send the killer of Rohith Vemula, Apparao to jail. Those who have been wronged in this university, those dismissed be restored to their positions and the culprits be sent to jail. The day is near. It is now 2019 and we will get our justice. Because days of violence and hatred do not last long. The vessel is brimming and would soon break. I appeal you all to stand by these two mothers in times to come like now. It is enough. Violence has been tested long. We have to bring it to the end. Like Savitribhai Phule had Fathima Sheikh standing by her, Radhika Vemula today has Fathima Nafees by her side. She is not alone. The whole of the country from north to south knows us as the two mothers who would not give up. Will you all stand by us in this resistance of ours until I get back my son, Radhika Vemula is served her justice and the culprits served jail? These people, what they did in JNU, they disappeared my son, fought with him, bloodied him, but none of them to this date has been deemed a culprit by police records. The admin there is so heartless, this Jagadesh Kumar. I sat outside the admin block crying for months but he never said that he will bring back my son. These people send their sons outside Hindustan to study and make our children the victims of their systems. Our kids wouldn’t die anymore, universities would now be ruled by us and our kids would lead and rule Hindustan tomorrow. These people sitting in Delhi know not how to rule. There is this yogi sitting in UP who has now become a bogi doing pujas over pujas. Look at him, the number of crimes he has done. If these people had a bit of shame, they would have come in front of us mothers and asked why we are talking against them. These people do not have the courage to face us. They saw the motherhood of these mothers and not the anger. In 2019, they will see the anger too. I promise sister Radhika that until I am walking and alive until justice is served to her, I will stand by her. My request to you all is that wherever there is violence, you see two or three but how many faces are there who do not– reach the media and those not reported? What about them?-Look at them too, stand by them. They too must be served justice. Why is all this to us alone? Why this violence and crime on our children alone? There is no employment for us, no salary, nothing. It is all going to these Adani Ambani. Everything goes to them and not our children. You should try what you can and we will pray for you all for you have the energy, the youth and the health. If you try, you will surely succeed. You people should have the same fire in you which we do. They think our tears have dried up but they haven’t. Our eyes now sparkle with fire. We have given up on crying. We will now make them cry. The wave came and brought in Modi. A stronger wave will come and Modi would be swept away. Very soon. I request you all to try your best like the JNU president Balaji who has set out to find my son. He is roaming around the country searching for the last six months. You too try your level best. He has organised a rally on February 7th in Delhi from Red Fort to Parliament. I request you all to gather for it from every corner of Hindustan and show the world your student power. Students have the power to bring up institutions and break them down as well and now is the time to show this power. I wouldn’t say much as I understand that many amongst you are not able to follow my language. I would just like to say, think over what I just said. 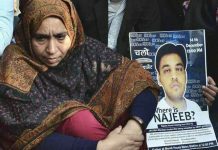 Your brother, Najeeb is alive and in the captivity of these people. I know. And if we all persist, he will come back. I am sure- inshallah- my son shall be returned to me. This fight is not the fight of two mothers for their sons alone but a fight for all of Hindustan’s poor, labour, homeless, farmers and Adivasis. Do not understand this resistance as our fight for our sons. We fight for all of you across this country. So that no mother of any of you assembled here has to stand here where we do. To the degrees each of us can, let us fight to bring down this rule. To Rohith Vemula’s mother, sister Radhika, I assure you that you will get your justice. Not now but in 2019. The murderers will be arrested and those who have evaded it all so far too would be put in jails. They came for five years and for the fifty years to come, they will have to bear the consequences. In these five years, they have committed so many crimes that they just made the provisions to be punished for fifty years to come. They have committed so many crimes across universities. Some crimes are bigger and hence they get caught. They are haunting many. It has all gone overboard in JNU. Those who stood beside me, the students, they were fined with Rs 20000/-. They were charged and those goons of ABVP who break things in front of admin’s block or dean’s office, to this day, no action has been taken against them. Those who hurt Najeeb roam free when the warden saw, the security saw, there are so many witnesses. But I trust in Allah and I believe in the law of this country. The culprits would be punished and my son would return to me.